Backpacking has come a long way in the last fifty years, and if you’re anything like this writer, whenever you hear about a new piece of gear, you get skeptical. It wasn’t long ago backpacking meant roughing it, but you can now find articles galore dedicated to the newest devices and gadgets that you simply “must have” to complete your trip and make your experience a step above the rest. Cupboards you can hang from a tree? You got it! Portable hand-powered blender? A necessity! You may be thinking, “why would I need a backpacking thermometer? If it’s cold, it’s cold! If it’s hot, it’s hot!”. But the benefits of buying one of these accessories can far outweigh the cost, saving you money long term and even making you safer. First and foremost, having a thermometer lets you track and log temperatures on your trip, allowing you to better prepare for the next time around and guide your decisions when buying temperature-rated gear like sleeping bags, tents, and clothing. Placing a thermometer in your tent overnight gives you a little insight waking up as to what you’re in for—50˚ F? You’re ready to climb out and face that sunrise. 10˚ F? Maybe you’ll stay in the sleeping bag a little bit longer. Besides the obvious benefits, once you get to know your temperature readings a bit better, changes in readings can give you key insights into animal behavior and changing weather conditions before they happen. This guide will introduce you to some of the features to look for and how to make your decision, as well as review some of the products you can consider. Thermometers are not one-size-fits-all. Yes, they all (should) say essentially the same thing, but they come loaded with different features that make your buying decision a little more precise. We’ll look at both analog (non-digital) and digital thermometers with a variety of features including barometers, altimeters, clocks, and pedometers. These features can be overwhelming, and you may end up with something you don’t need or missing something you do if you don’t do a little homework. Have no fear! We’re here to help, and the biggest question to ask yourself is: what do I intend to use this for? Let’s divide this up a bit further. Casual trips or major treks? Regardless of what you want to use your thermometer for, durability is a key consideration. If you’re a weekend warrior or the venerable Spring-Break-and-Memorial-Day-Weekend-warrior, you may not need to opt for the top class in durability. There’s no need to spend extra money on an ultra-solid product if you’re never going to test its upper limits. If you’re a bona fide trekker, on the other hand, you’re going to need something that can handle a little more wear and tear. Even among the latter group, do you baby your gear or are you the type to throw it where it lays? We talk about which products are rated high in durability below, so consider how important this feature is to your buying choice. This is an offshoot of the durability question and relates largely to whether you want to purchase an analog or digital model. If you mostly travel in a wet and rainy region or spend your time on the water, you definitely want to opt for a waterproof thermometer. While some digital models boast that they are waterproof, analog thermometers generally do a lot better when dropped into a puddle or, say, a lake. Additionally, batteries don’t do well when they’re constantly wet, so if you’re going to be soaked for two weeks straight, you might want to reconsider the electronics (or invest in some plastic bags). On the other hand, windy, dry, ultra-hot or uber-cold conditions can pose additional threats to some thermometers. We’ll mention a few products below that do well, and not so well, in extreme temperatures. Do I want to track – or predict? And here we get into the features question. For many of us, there is little use in predicting the weather while backpacking. It may be nice to know when we’re going to get rained on, but we’re going to have to hike through it anyway. Instead, a thermometer serves mostly as a tracking tool to help us remember our trip, journal about it, keep track of particularly nice or windy spots, and compare our gear with its temperature rating (“I thought that sleeping back was rated to 15˚. Turns out I was freezing at 25˚!”). Comparing the temperature we feel with the rating we buy can help us make informed gear decisions in the future, saving us money, time, and frustration when we buy new stuff. In this case, a straight-forward thermometer will do the trick. If you’re interested in tracking altitude, barometric pressure, or distance, an altimeter, barometer, and pedometer respectively are neat features, but not essential. However, when you get into weather prediction territory, they become much more vital. Now we know that not even the weatherman can truly predict the weather, but in some circumstances an attempt at accurate weather prediction is essential. If your trip involves summiting high peaks or climbing in alpine areas where lightning is a risk, waiting for windows of good weather before pushing forward can literally mean life or death – remember Grand Teton National Park in July 2010? Alternatively, on backpacking trips in the desert where water is scarce, predicting storms can allow you to plan water usage and prevent dehydration. To do these things, you need a barometer. A barometer, like a traditional thermometer, uses mercury to function and can be either digital or analog. When the barometric pressure drops, moisture is building in the air, indicating storms are on the way. When it rises, the moisture is clearing, and the clouds follow suit. This useful feature is often coupled with thermometers and can be an important factor in your buying decision. There are several other features of combined thermometers that you can consider as well. For instance, barometric pressure can help predict fish feeding activity, optimizing your catch-of-the-day. Altimeters can be used to check your location against topographic maps when traveling cross-country or off-trail, and pedometers can be used to calculate your calorie-burning potential for the day. Using the guiding questions above, check out our guide on the featured products below to find the perfect fit for you! 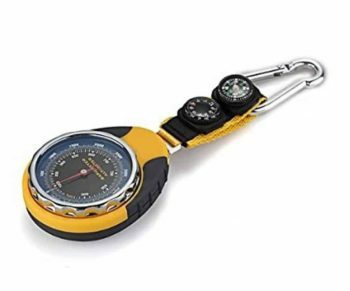 The SODIAL(R) 4 in 1 Compass Barometer Thermometer is an analog barometer and altimeter with attached compass and thermometer designed for hikers and backpackers on the go. It’s compact design with built-in carabiner is perfect for attaching to the outside of your pack or arm straps for quick consultation, and its easy-to-read interface provides a simple, straight-forward user experience. Downsides to this product include the lack of backlight, which means difficult readability at night or in low visibility conditions, as well as the upper altitude limit of 5000 m. The altimeter measures in 20 m increments and the barometer in 5 hPa, providing a less-accurate reading than some of the other options and a weaker candidate for weather prediction. Additionally, this product only measures in meters and ˚C, requiring some quick conversion skills for American users. On the plus side, it is fairly durable, making it an acceptable choice for long-distance backpacking trips where tracking and navigation are the goal. It is small, compact, and easy to attach to just about anything – and the sleek design is a sight for sore eyes. This product is a higher-budget option well-suited for short day-trips to multi week treks in all types of weather for trail journalers and curious cartographers. The Coghlan’s Time/Temp Digital Dangler is a budget-priced option with few features for casual hikers and backpackers. This product offers a digital thermometer with ˚C and ˚F display options, a clock with both 12 hour and 24 hour display settings and alarm, and a calendar that displays the day of the week, date, month, and year. The biggest downfall of this unit is its durability and sensitivity – this thermometer is known to struggle, and even reset, in extreme temperatures and does not bode well in the rain. Body temperature and sunlight can affect the temperature readings, as with many other thermometers, so users must be careful to place it in a shaded area for accurate readings. Additionally, despite the digital style, the Coghlan Dangler does not utilize a backlight, making the display difficult to read in low-visibility conditions. However, there are perks to this product. Besides the low price, this product has satisfied many customers with it’s simple, easy-to-use interface and compact design. Coghlan has produced several trusted camping and backpacking products over the years, and you can’t go wrong with the simplicity if its simplicity you seek. 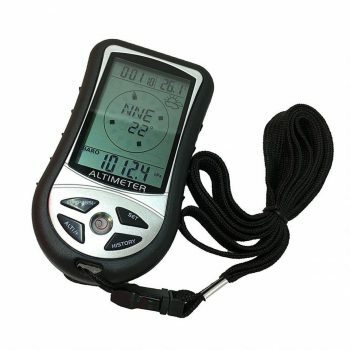 This is a product well suited to casual hikers and backpackers with small budgets looking for a simple tracking tool. Related: Coghlan’s also offers two small whistles with thermometer functions, the Four Function Whistle with included thermometer, magnifier, and compass, and the Six Function Whistle with thermometer, magnifier, compass, L.E.D. light, and signal mirror. 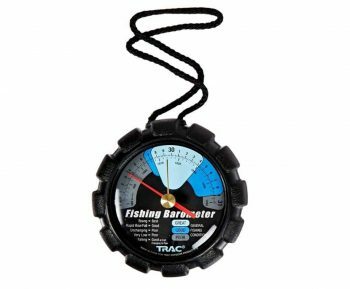 Description: The Trac Outdoor T3002 Fishing Barometer is, well, not technically a thermometer. It is, however, a useful tool for fishers and backpackers alike! Trac Outdoor is a family-owned company out of Nashville that strives to create a little more ease in the world of outdoors-minded folks – and they do it in style. This product is an analog barometer the features an integrated calibration system and color-coded interface that shows the user exactly when the best times to cast a line are. If you’re one of the many backpackers who fishes for fun or food, this might be the option for you! If not, this barometer still has many desirable features. This is the most waterproof product on the list, so when this one falls into the lake, your water bottle, or gets totally drenched in a downpour, you’re good to go. The color-coded fishing legend can be easily adapted to your most desirable weather windows, making this a good tool for weather prediction as well as fish prediction. On the downside, the easy calibration system makes this unit easy to un-calibrate, and it needs to be regularly re-adjusted to maintain accuracy. Like mentioned above, this product does not feature a thermometer at all, so if you’re looking for a way to track temperature, this is not it. Overall, this product is well suited to weather prediction in all types of climates, including the special addition of fishing trips. Description: The BDPOWER 8 in 1 Digital Multifunction LCD Compass is the go-to all-in-one product on this list. It combines a digital thermometer, compass, barometer, altimeter, clock, calendar, weather forecasting tool, and backlight, making it the ultimate combo for the serious tracking and predicting connoisseur. It is highly customizable, switching between ˚C and ˚F, meters and feet, and a 12 hour or 24 hour clock display. With proper and regular calibration, this is a highly accurate unit, making it a great option for navigation on cross country trips. The cons of this product include the somewhat complicated interface – so many features in one make it a little less user-friendly and can create some confusion calibrating the barometer, which needs to be done often. Another downside is fact that it relies on batteries, which adds weight and poses an issue for long treks, as spare batteries take up significant space and are susceptible to harsh weather. The pros include the backlight (yay, right? ), the accuracy, and the detachable lanyard that will prevent you from accidentally dumping this guy off the top of a mountain. This product is well suited to short to medium length backpacking and mountaineering trips where weather prediction and cross country navigation are necessary, and the mid-range price is hard to argue. 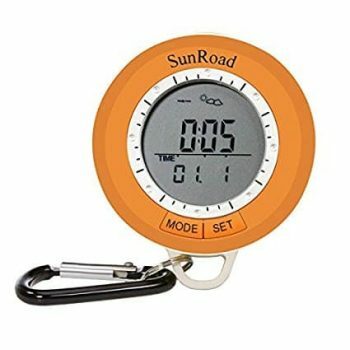 Description: The SunRoad SR108S Pedometer Altimeter Thermometer Compass is a small and sleek digital thermometer with included altimeter, pedometer, compass, and weather forecasting tool. This little super computer claims Swiss accuracy along with its many features, making it a useful companion for hikers and backpackers who want to predict weather and track their distance with peace of mind. 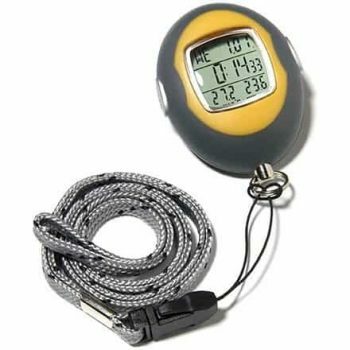 This is the only unit that features a pedometer and calorie calculator, making this an inexpensive alternative to many personal fitness items (they don’t even have barometers!). The SunRoad SR108S also boasts IPX4 waterproof status, which, to this reviewer, is both a pro and a con. IPX4 means that this product is resistant to splashes, but not submergible or resistant to focused water. That means that while this thing will stand up to some light rain, a torrential downpour or a misplaced elbow could end its career as your perfect hiking companion. Additionally, users claim that this product eats through batteries, making it a less-than-ideal option for longer trips. Overall, this is a practical product for a decent price that is perfect for short backpacking trips in good weather. It is accurate, easy to use, and can be used to reliably track weather and keep personal fitness goals. Related: SunRoad makes several similar products that range in price and features. For a similar item, check out the SR204 Mini LCD Digital Fishing Barometer, which features an altimeter, thermometer, and fish finder. All of these products have a time and a place (and a budget! ), and hopefully this list has helped you figure out which one is for you. Once again, consider what you need, where you are going, and how long you are going for, and these reviews should help you out! Thermometers, barometers, altimeters – oh my! We’ve gone over the features of these handy little gadgets as well as how to guide your shopping experience. We’ve looked at factors like durability, accuracy, measurement units, and added features like pedometers and backlights. We’ve looked at why you might want to track temperature, forecast weather, or predict fish behavior, and the specific products you can buy to do it. Do you use a thermometer on your trips? What do you use it for? Let us know in the comments!